Waterproof full-length glove in stretch softshell', with leather palms for grip and durability', and hand-warmer pockets on back of hand. Salomon gloves are made of high quality leather that is strong enough to ensure durability and soft to provide great comfort. Microfiber insulation for downlike softness and warmth without bulk. Made of very soft material placed on the thumb', the nose wipe allows for easy removal of snow or water from the face without irritating the skin. Waterproofed zip on the top of the hand. Open zip allows ventilation thanks to mesh inside', warmth when zip is closed. The small pocket can contain a handwarmer. 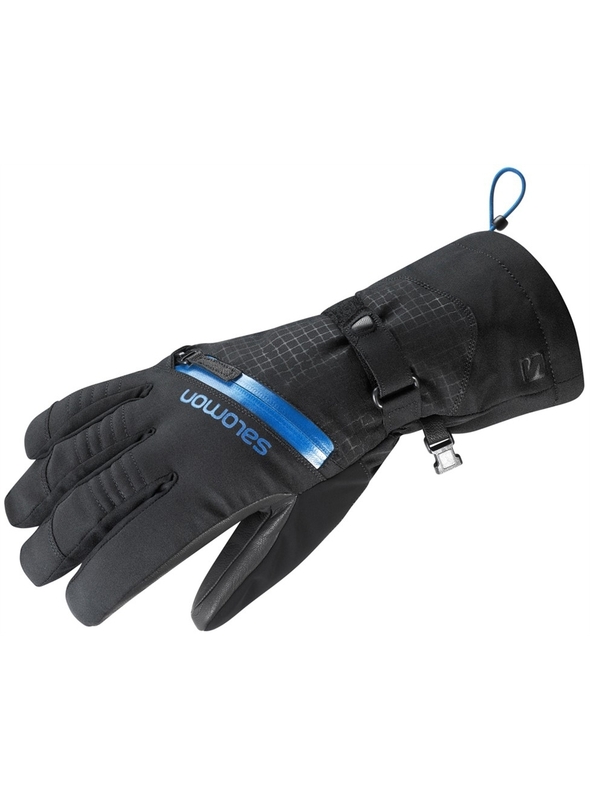 Salomon long cuff gloves with cinch closure are great to cover jacket sleeves. Warmer and cosy thanks to the fur', it provides protection from the snow. A breathable and very stretch fabric for the perfect motion fit.